Is your product data dependable? Do you know where it is stored and who can access it? You publish various materials to develop your business, and your products are presented and sold on several channels. The data describing your products is unfortunately too often scattered in different files (Excel, Word, PDF…). You need to manage manually this multitude of files; and every change, every update feels like wasted time and loss of control over your information. Inevitably, mistakes crop up. 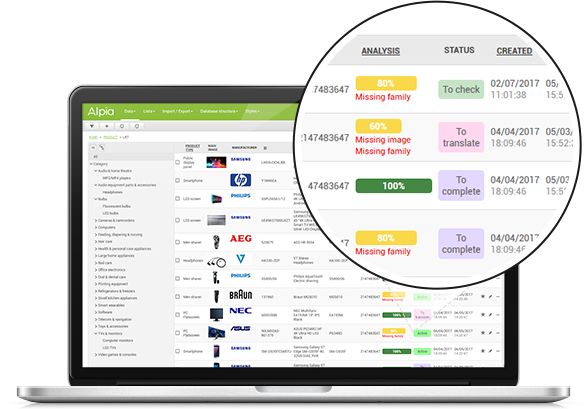 Rethink your definition of workflows, specify the roles of everyone involved in your projects —your team, your customers, your suppliers, your partners— and discover our solution: Alpia. 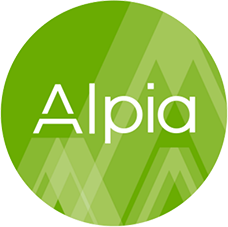 ALPIA groups functionalities of Product Information Management (PIM) and Master Data Management (MDM). It allows you to define, centralize, secure, store, maintain, distribute and provide you with a complete, reliable and up-to-date view of master data in your system information, no matter the channel. 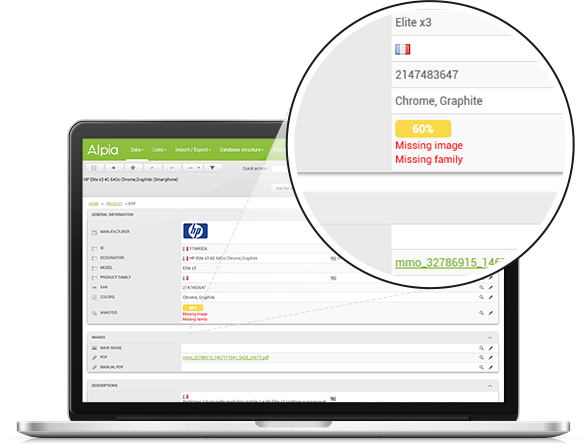 ALPIA allows data enrichment, sharing and omnichannel dissemination. 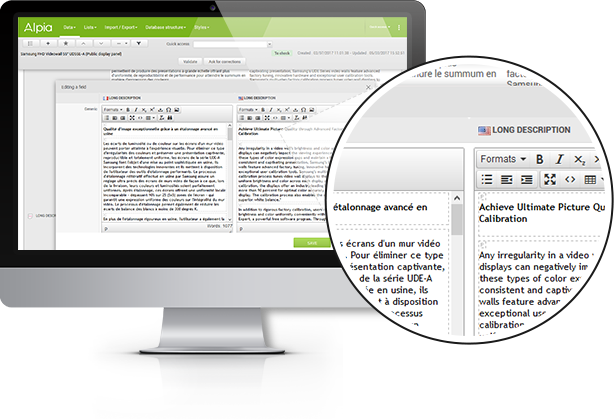 Centralization of your product data, thanks to total control over storage of your information and of your various users’ rights, specifying the role of each user and which edits each can make. Data elaboration and optimization of natural referencing with search engines (Google, Bing, Qwant) through a highly-configurable organization of product data by medium, and unlimited management of tables and fields, generating reliable relations between your products, ranges, brands, etc. Import/export functions in various formats (native Excel, XML, CSV) and synchronization with your e-Commerce platforms and Information System (ERP, CRM, DAM), following an automation process and data enrichment strategy, allowing you to apply each update to all media. 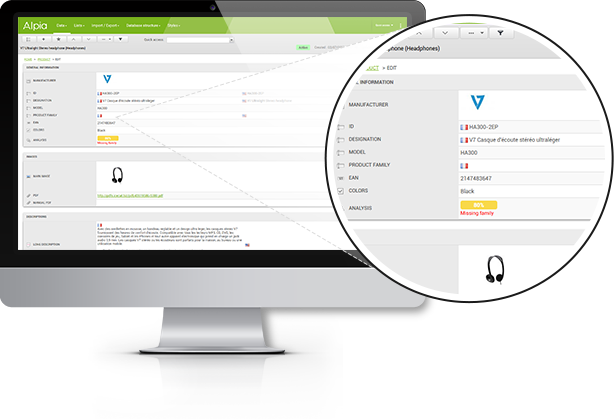 Validate your product sheets, translate them, orchestrate multilingual versions from a single interface , and export them to all the media and channels that present or sell your products around the world. Thanks to a powerful workflow engine, everyone involved in developing your web and print repository can access, enrich and control all your data throughpredefined user rights. Import and store your information in a library organized by product cards, configuring your characteristics and categories, integrating your photographs or technical documentation and centralizing your data updating. 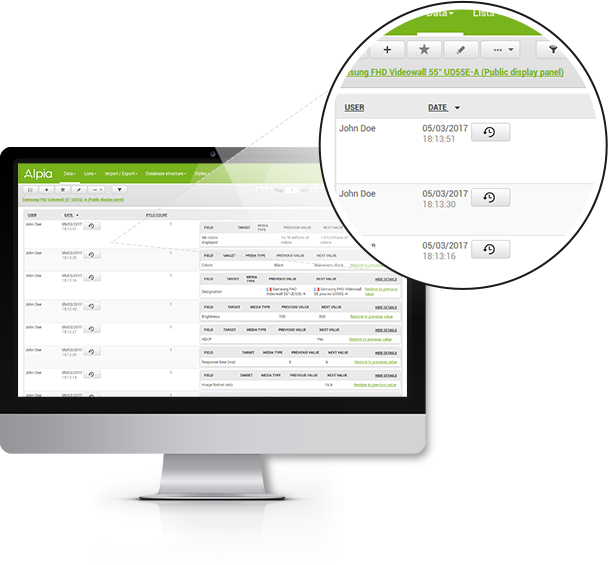 Organize your updates and validations to guarantee consistency of product data and easily control the harmonization and secure circulation of information. Classify your data as entries, which you define according to your needs. Consult the full data repository, and sequence the status of every product. Our product sheets offer you much more than simple data storage. 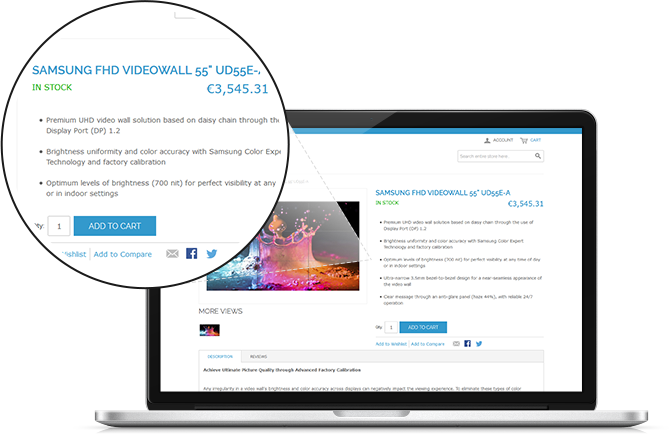 Entirely configurable , they enable you to carry out several actions simultaneously: calculation of discounted prices, digital conversion, formatting, etc. 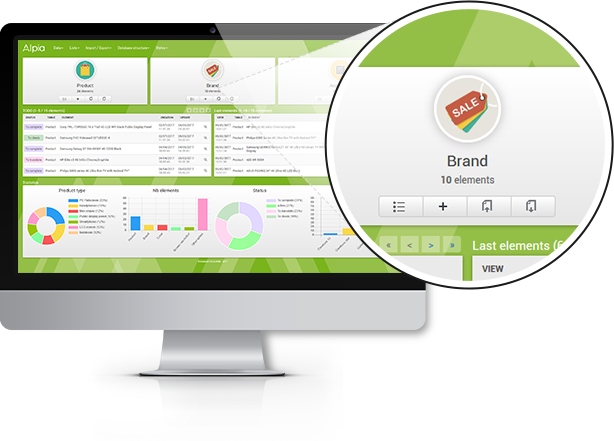 In a flash, view product cards that are incomplete, recently edited, incorrect or obsolete and trace every user action undertaken on a product sheet. and keep your peace of mind! Receive exclusive information about our solutions and our latest news.